by Mary Ellen Copeland, M.S. 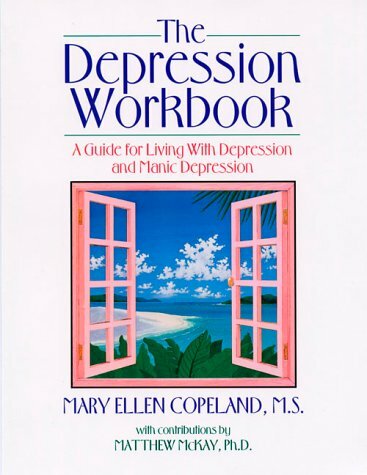 One of the best workbooks I've found that deals with the thoughts and feelings that surround living with depression and manic depression. A "hands-on" book, filled with hundreds of suggestions and exercises that require active participation and thought. It will make most people seriously think and work on their treatment, whether on their own or as an adjunct to psychotherapy. At over 300 pages, this is a great bargain, and also includes a great resource list in the back. It's hard to give a more detailed review about this book, because it is very much a workbook full of exercises. The exercises are divided into 22 chapters in five parts. With titles like, "Using a Chart to Keep Your Moods Controlled," "Family Support," "New Ways of Thinking," and "Using Relaxation to Stabilize Moods," you can tell the pro-active approach the author is expecting from the reader. They need to actively think and be open to changing their way of thinking and feeling in order for this book to effect change in their life. This may seem like an obvious statement, but is the crux of most self-help books. A lot of people buy them expecting that simply by doing the exercises, that alone will make them change. Of course it doesn't work like that. The exercises are meant to help guide a person along to change, but the change must ultimately come from within. A lot of the exercises are focused on helping you identify your feelings. A large part of change involves first explicitly identifying the problems. The author helps you do that with extensive checklists and free-form, open-ended questions. I find that most people find lots of exercises in each chapter to be helpful to them; exercises can be easily skipped if they aren't relevant to the reader. The author, Mary Ellen Copeland, has battled her own depression on and off for years. Her books are written largely from that point of view, not that of a distant professional. Her writing benefits from this perspective, making the workbook easy to digest and make it one's own. This is the kind of book that should be begun at the start of anyone's psychotherapy, as it is such a vital tool to help in the recovery of depression.